So after doing some additional reading at the suggestion of @drnic, I read what @tmornini said about the changes occurring. What is the stated view of events? EngineYard is growing up. I can believe this as a plausible explanation, I state this because I have personally gone through this type of change at several of the startups that I have founded (specifically @Surgient & @Hyper9). Companies change and mature (at least hopefully they do). As these changes happen, the companies aren’t always the right fit for the same group of employees that were there in the very beginning. This is actually a very frequent occurrence at successful companies, one of which that comes to mind is VMware. I watched from the outside as a customer and partner, VMware went from a <100 person company when I first worked with them to an independent subsidiary of EMC with >100K employees. Now VMware has multiple companies that are subsidiaries of it! I still am left wondering what EngineYard’s real plan is, although I did see a mention that the customers leaving might have been on an old hardware platform as well. I will post more if/when I find out more. EngineYard looks like it is in an exciting phase and a great place to work (great momentum). and then Pivotal Labs app Pivotal Tracker is leaving under similar circumstances (IMHO). After receiving feedback from several readers and the desire to see the results, I have updated and reformatted my previous Cloud Cost Comparison. I have included comparisons between Microsoft Windows Azure, Amazon EC2, Rackspace Cloud Servers, and Joyent SmartMachines in this spreadsheet. This spreadsheet includes normalized data across CPU, Memory, Disk Storage, Disk Throughput, and Cost. Disclaimer: I work for Dell in DCS group, we build cloud solutions based on RackSpace, Joyent, and Azure technologies into the market. This blog post is based on public information and expresses my analysis based on that public information. It is NOT based on ANY Dell or partner proprietary information. I decided to do this based on today’s PDC 2010 announcement of the Microsoft Extra Small Instance. I wanted to compare and contrast Amazon’s EC2 Instances with Microsoft Azure’s Instances. I came across what I believe to be an error on Microsoft’s website (both Medium and Large Instances currently show as $0.48/CPU hour. Below is a picture of the spreadsheet I put together. I will put a link to the XLS up later, I’m looking for corrections and input on improving this. 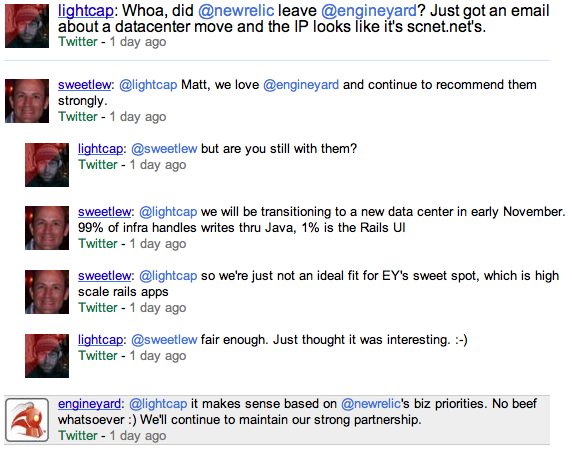 GitWrite – A Blogging Platform backed using Git, Rails, and Twitter! Miss Monitor – (this is their summary, the project isn’t up yet) > Collect, aggregate and visualize static and dynamic data about your application and libraries. This includes for instance performance data collected from services like New Relic or code statistics like flog score and lines of code. The goal is to provide an overview how your application develops over time and helping to identify connections between different kinds of data. SaaS Modeller – (this is their summary, the project isn’t up yet) > Our app will help SaaS startups forecast the impact of pricing and conversion rates on their monthly recurring revenue. It will automatically create a spreadsheet that projects their revenue for the next 2 years. Based on Ryan Carson’s SaaS model google spreadsheet. It will factor in churn rates, lifetime profits from customers and other useful metrics to help founders find the right model. SaaS Metrics – Nice Dashboard providing Metrics on Subscriber Churn, Customers, Cash, etc. Blob.ly – Grabs a website, evaluates and decomposes it, then let’s you share and collaborate about output. WhackMeUp – A word game leveraging Google and Twitter. The Unpack-App – (this is their summary, the project isn’t up yet) > Aren’t you tired of all these zip and rar files polluting your inbox? We have decided to save the planet removing all these packagings for you! Update: I got a response on twitter from Ezra Zygmuntowicz see below. Following yesterday’s post looking into Ruby’s creator Yukihiro Matsumoto’s visit to VMware’s Headquarters, I have gotten new information. 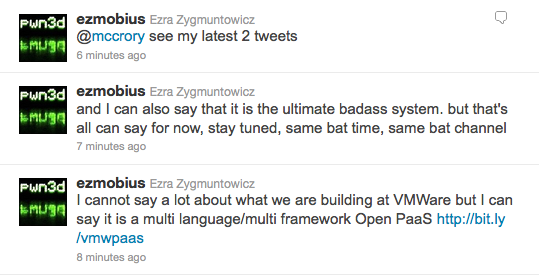 VMware has hired former EngineYard Co-Founder & Software Architect and Ruby Developer Ezra Zygmuntowicz to work on Ruby for VMware (Some type of project is underway). According to this source, there are rumors of a Ruby based Cloud Controller of some type being worked on. This may begin to resolve several of the bits of information from yesterday regarding VMware’s interest in EngineYard and Ruby. There is also further confirmation that Ruby is getting a lot of attention inside of VMware and the company is looking at joining Ruby organizations (I believe in an attempt to begin building credibility inside the Ruby community). Note that I am referring to Ruby broadly, the specific Ruby derivative could easily be JRuby vs. pure Ruby. This The Register Article talks about VMware looking to both Ruby and PHP as part of their Cloud Application Platform. There was also a rumor a few months ago on GigaOM about VMware acquiring EngineYard (There hasn’t been anything announced or said since). An article in the SDTimes about EngineYard using Terremark as a platform for Ruby with VMware as the middle layer and calling it xCloud. So what is the takeaway from all of this? VMware appears to be looking at Ruby or JRuby as a possible 3rd major programming language to bring under its wing. More interestingly is that Ruby/JRuby could be used to weave Cloud Services and Applications together and automate them on the backend. This can be done with Java, but the learning curve for and administrator would be high compared to leveraging Ruby (especially if the admin already understands Powershell).